What should you do when the party’s getting started and the beverages aren’t yet cold? With Spin Chill, they’ll be ready in a minute—literally. This innovative beverage chiller cools a can of beer or soda or a corked bottle in 60 seconds. 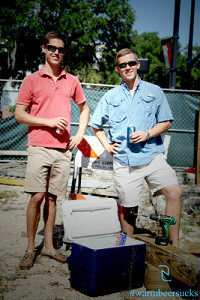 Like many college students, Trevor Abbott and Ty Parker used to cool warm beer cans by putting them on ice. It didn't take long for these two mechanical engineering majors to wonder if spinning the cans in the ice, a process known as convection, would cool things down faster. Not only does Spin Chill work, it cools beverages at a rate 20 times quicker than an ice bath. And, because Spin Chill rotates without shaking, the cans don't overflow when openend. 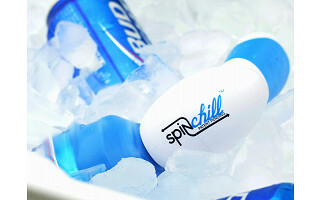 Designed in Gainesville, Florida, Spin Chill uses 4 AA batteries for hands-free operation and is small enough to fit in a pocket or purse for an ice cold drink whenever, wherever. Hello, we are Trevor and Ty and we are Spin Chill. We were tired of waiting on our drinks to chill down so we started spinning them in ice by hand, like we had seen other people do. After a few beers we decided to make a device that would spin them in ice for us so we didn't have to anymore. We're excited to work with The Grommet. Please fire away at any questions or comments you have. Love the Idea... is there a prototype in the process for a 6 pack? one is great but when friends come over need a few quickly..
Great idea. Trevor will love it, if not already in the works. @Jeffrey, The greatest part of the Spin Chill is that it only takes 60 seconds max to completely cool down a can, so everyone will be enjoying their beverages in no time! @Matthew @Jeffrey Sorry, we've been swamped with emails and just now got a chance to hop on. We have some things up our sleeves, having the mechanical engineering backgrounds, we'll keep SpinChill going. We usually just throw a few Spin Chills in the cooler for now. I absolutely LOVE this product. We were able to test it out and I was amazed by how cold our warm beer got in under a minute. I cannot say enough about it, and it is such a simple solution. Thanks for coming up with this Trevor and Ty! @Matthew Thank you very much. Hope the testing went well, we usually have to limit it or numbers start to get skewed. This is super awesome! If it will cool beer bottles, will it also cool plastic water bottles? Good question. Trevor can answer and will be along shortly. Sorry for the delay here. @Amy @Cliff Sorry for taking a little to get back to you on this. It does also work on plastic soda and water bottles. It takes longer than 1 min since plastic is a good insulator but it definitely does work. I am looking into getting this product but had a question. It says it chills the beverage, approximately how cold is the beverage after the 1 minute cycle? Is it ice cold? If not will it get ice cold if you run it again? Thank you for your time. In testing it here at the office we found it to be ice cold, but you can run it for a few seconds longer if you are unsure if your beer will be cold enough. @Trevor Hello, I love the idea of this product! I was wondering though which materials are made in China and which ones from Indiana? @SANDRA Hey Sandra, The bodies that contain the motor are manufactured in China and the rubber part that clips onto the container is manufactured in Indiana, then they're all assembled in Gainesville, FL. Having the whole unit manufactured in the US would cost an astronomical amount unfortunately, due to all the assembly required within the body. @Trevor Thank you for answering my question in a straightforward manner. I understand the expense involved when you are a small company. I just wanted to tell you how much I appreciate that you made an effort to keep most of the manufacturing here in the U.S.A. You not only created jobs here but you also made your product more affordable to the average buyer. @SANDRA Thank you very much. Ty and I really appreciate the support. 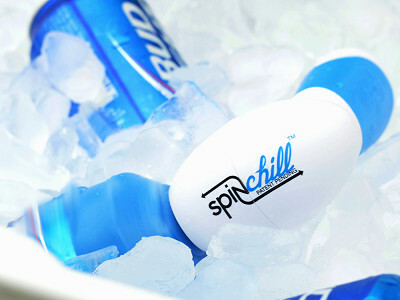 We have been able to keep the Chill Bit (another SpinChill product) all made in the USA. We've found that the largest cost now is really labor. Neat! This inspires ideas for further utility of cold convection in my mind, i'm not an inventor or engineer (math holds language barriers for me) but I often have ideas for expanding the utility of others discoveries. I have an idea that may increase the effectiveness of your product - would you be opposed to me purchasing one to experiment with and maybe engineer something of further use that I could share with you? I love that this product is inspiring the inventor within you. Trevor and the Grommet team here would love to see what you come up with. What should you do when the party’s getting started and the beverages aren’t yet cold? With Spin Chill, they’ll be ready in a minute—literally. This innovative beverage chiller cools a can of beer or soda or a corked bottle in 60 seconds. Like many college students, Trevor Abbott and Ty Parker used to cool warm beer cans by putting them on ice. It didn't take long for these two mechanical engineering majors to wonder if spinning the cans in the ice, a process known as convection, would cool things down faster. Not only does Spin Chill work, it cools beverages at a rate 20 times quicker than an ice bath. And, because Spin Chill rotates without shaking, the cans don't overflow when openend.